Peel the onion and chop it roughly. Peel and crush the garlic and put it with the onion into a medium-sized, heavy-based saucepan. Peel the ginger, cut it into thin shreds and stir that in too. Add the lentils and pour in 6 cups of water. Bring to a boil, then turn the heat down to an enthusiastic simmer. Stir in the ground turmeric and chili powder, sea- son and leave to simmer, covered, for twenty minutes.While the soup is cooking, bring a medium-sized pan of water to a boil. Peel the pumpkin and scoop out the seeds and pulp, then cut the flesh into fat chunks. Boil the pumpkin pieces for ten minutes, until they are tender enough to pierce with a skewer without much pressure. Drain them and set them aside.To make the onion topping, peel the onions and cut them into thin rings. Cook them in the oil in a shallow pan until they start to color. Cut the chili peppers in half, scrape out the seeds and slice the flesh finely. Peel and finely slice the garlic and add it with the peppers to the onions. Continue cooking until the onions are a deep golden brown. Set aside. Remove the lid from the lentils and turn up the heat, boiling hard for five minutes. Remove the pan from the heat, then add the drained pumpkin. Puree the soup in a blender (for safety, a little at a time) until smooth, then pour it into a bowl. Stir in the roughly chopped cilantro and check the seasoning. I find this soup likes a more generous than usual amount of salt. 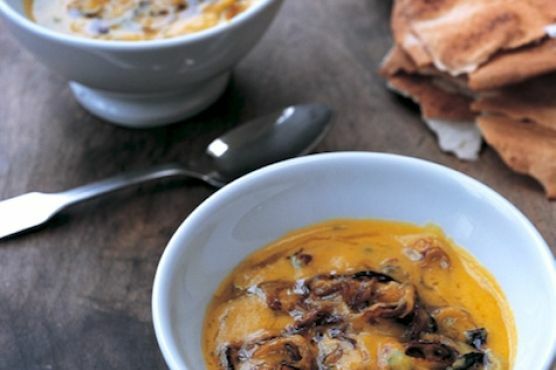 Serve in deep bowls with a spoonful of the spiced onions on top.